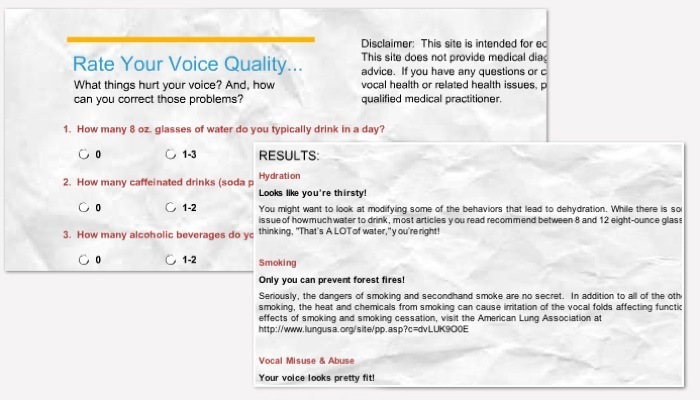 The “Rate Your Vocal Health Survey”, (aka “Cosmo Quiz”) was created to help students diagnose the health and vocal quality of their own voice. Based on the popular magazine’s “rate your love-life survey” the site is a Likard-style questionnaire about lifestyle choices the student makes. The activity helps students determine the overall quality of vocal health and recommends practices for improving/or keeping their voice in shape. The activity’s logic provides custom responses based on students’ answers. This entry was posted in Interactive, learning activity, website and tagged fine arts, flash, theater, voice, xml by Britt Carr. Bookmark the permalink.